Let’s take M’s and O’s beyond the ordinary. Treadling variations bring out interesting patterns. And a little bit of color in the right places makes a unique border stripe. What other designs will emerge on the remaining towels, I wonder? 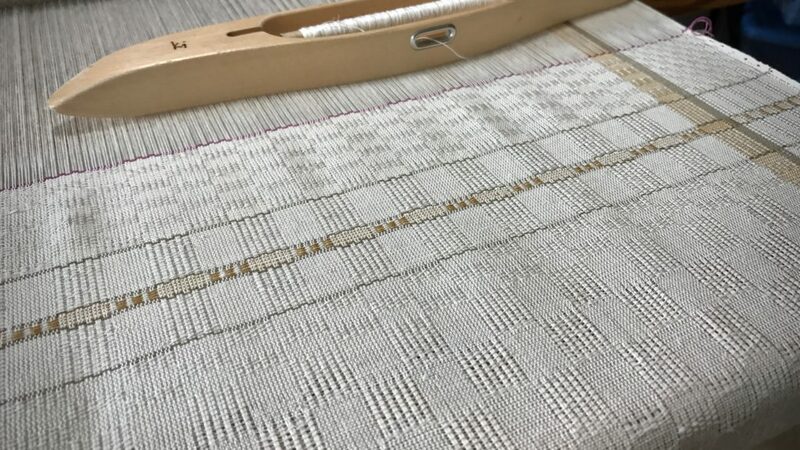 Treadling variations produce an interesting pattern in this M’s and O’s fabric. Border pattern uses one of my favorite techniques, the two-pick stripe, to draw a fine line. 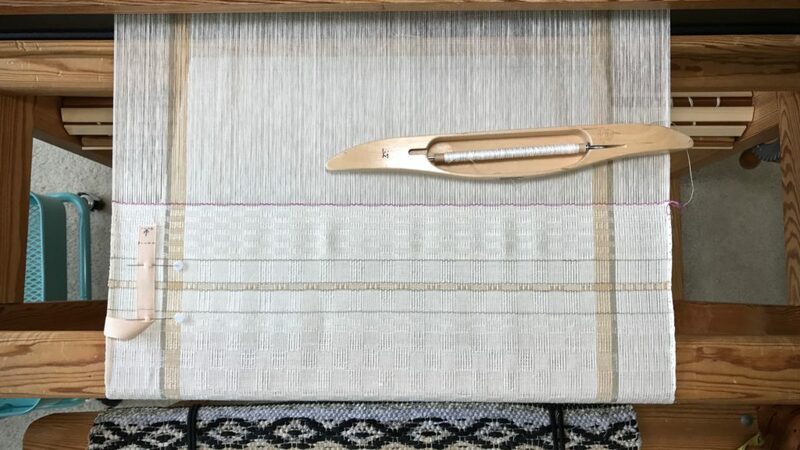 The center “ribbon” of the border pattern uses two shuttles to alternate the weft colors. 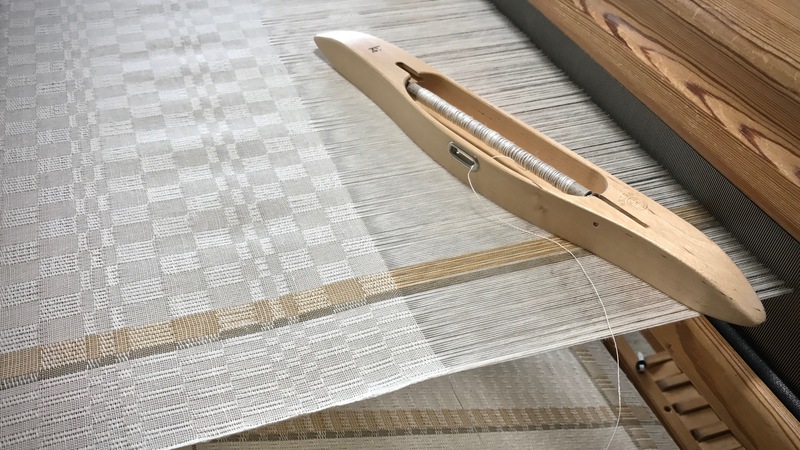 Some projects on the loom are complicated and tedious. This one isn’t. With primarily one shuttle and simple treadling, this is breezy easy weaving. The hard work was in the hours of preparation, dressing the loom. Threading and sleying 896 ends is no small achievement. But now, because of that work, it’s pure enjoyment to sit here and weave. Ready for the next M’s and O’s design. My sister came to visit, so, of course, she is persuaded to try her hand at weaving. Lookin’ good, Sis! Forgiveness is hard work, too. It takes effort to put away bitterness and anger. But we must. It paves the way for unhindered kindness, which our world desperately needs. Forgiveness changes you. If you’ve been forgiven, you know that. A forgiven person becomes a forgiving person. And when we forgive, which is never easy, we are threading heddles and sleying the reed. Our efforts make way for the pure enjoyment of dispensing kindness. And we discover that the fabric of our life is being made into something beyond the ordinary. May you be on the receiving end of forgiveness. 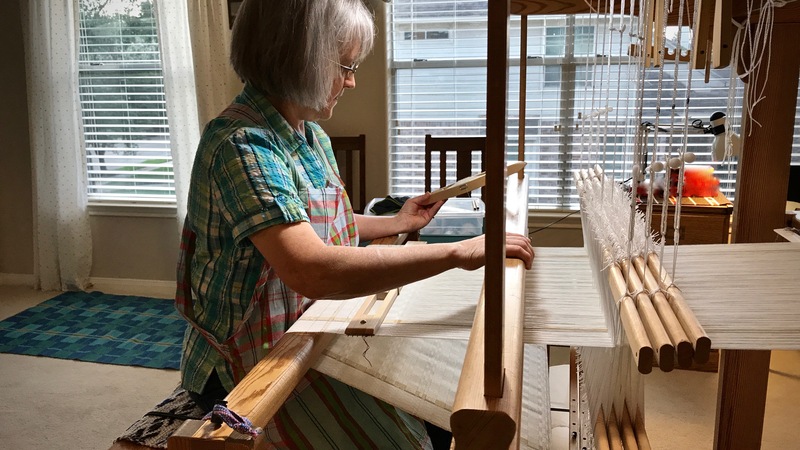 The Discovery Towels workshop in Eureka Springs, Arkansas, August 24-26, is filling up! If you’d like to join us, call Debbie (at the number below) right away. I would love to see you there! Kind words to live by….thank you. Hi Bruce, Thanks for weighing in! A little kindness goes a long way. I needed that message. Thank you for following the Holy Spirit’s lead, for many see the need to forgive. Especially me. Pam, Thanks for letting me know how this touched you! This is a message I am “preaching” to myself. We’re all in this together. Did I miss something? I haven’t received an “Warped for Good” for since this entry June 27 2017. I miss hearing from you. Hi Pam, Thanks for checking. I’ll be back soon! I have stepped out for the month of July. I will greet you again with a new post on Tuesday, August 1st!